Gargour Automotive Company unveils the stunning new Giulia - one of the most brilliant examples of Alfa Romeo’s automobile excellence. All of the legendary Alfa Romeo models combined heritage, speed and beauty, making them the highest expression of Italian style in the automotive world, and the new Giulia, which has just been launched in Lebanon by Gargour Automotive Company (GAC), the only authorised distributor of Alfa Romeo, Fiat, Chrysler, Dodge, Jeep®, Ram and Mopar® brands in Lebanon, is no exception. “The launch of the stunning new Giulia sees a new page being written for the brand that never ceases to surprise with a model that combines the past, present and future and is one of the most brilliant examples of Alfa Romeo’s automobile excellence,” said Negib Debs, General Manager of GAC during the launch event. Gargour Automotive Company launched the stunning new Giulia with a glittering event at the company’s flagship Dora showroom that was made even more special by the presence of Miss Lebanon, who was presented with the keys to a brand new Alfa Romeo Giulietta during the launch. “Given that Alfa Romeo’s are renowned for their beauty, it’s only fitting that a beauty queen should drive an Alfa Romeo,” added Debs. A.L.F.A. (standing for ‘Anonima Lombarda Fabbrica Automobili’, which translates as ‘Lombard Automobile Factory, Public Company’ in English) was established on June 24, 1910, in Milan, Italy. The company has been involved in car racing since 1911, and has competed successfully in many different categories of motorsport, including Grand Prix motor racing, Formula One, sports car racing, touring car racing and rallies, competing both as a constructor and an engine supplier, via works entries (usually under the name Alfa Corse or Autodelta) and private entries. The first racing car was made in 1913, three years after the foundation of the company, and Alfa Romeo won the inaugural world championship for Grand Prix cars in 1925. The company established a strong reputation in motorsport and this created a sporty image for the marque. 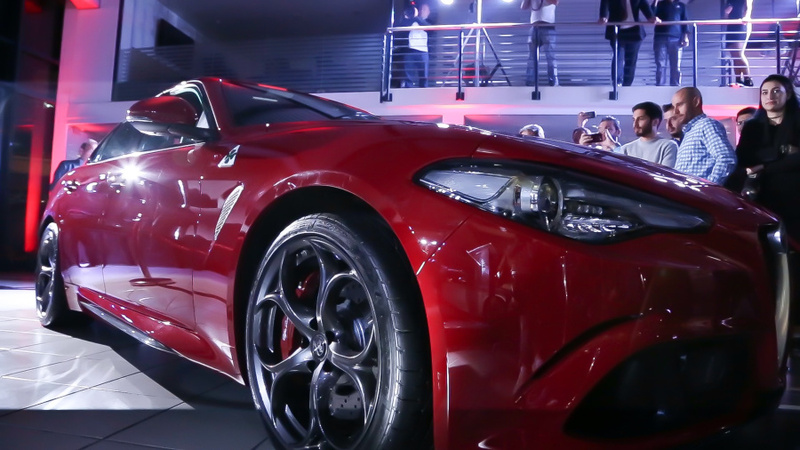 The reverence people hold for Alfa Romeo has grown with each milestone along the way. in 1962, the introduction of the legendary Giulia sedan boldly combined an enormously powerful engine with a lightweight body meant purely for street use - unheard of at the time. The new 2017 Alfa Romeo Giulia is undeniably inspired by its namesake of a half century ago - in its elegant style, alluring details and impressive aerodynamics - and its own set of breakthrough innovations. All in all, not only is the thrill of driving back - it’s better than ever. There are five elements that made Alfa Romeo one of the world's most desirable automotive brands: distinctive Italian design, state-of-the-art, innovative engines, perfect 50/50 weight distribution, unique technical solutions and the best weight-to-power ratio. These are the essential ingredients to create an Alfa Romeo and which deliver the 'meccanica delle emozioni' (or 'the mechanics of emotions' in English). This distinctive line, used worldwide in Italian only, pays homage to the homeland where the legend was born over a century ago. And today still, the brand carries Italian-made pride on everyday roads, on the most famous race tracks and in the hearts of millions of enthusiasts. The new Alfa Romeo Giulia line up comprises four trim levels - the 280hp 2.0-litre V6 powered Giulia, Super & Veloce models plus the brand’s new benchmark, the Giulia Quadrifoglio (QV), which is equipped with a powerful 510hp six-cylinder 2.9-litre turbo petrol engine inspired by Ferrari technology and expertise. Both engine options are made in Italy and built entirely in aluminium. The Giulia delivers outstanding performance levels, but in an environmentally-friendly way as always, ranking best in its class in terms of emission levels, with 198 grams of CO2 per kilometre. And Alfa Romeo engineers also focused on safety features - the car is designed to brake from 100 km/h to 0 in less than 32 metres. Genuine Alfa Romeo performance is fitted like a tailor-made garment with a distinctive design that expresses three typical features of Italian style - a sense of proportion, simplicity and surface quality finish. The entire creation pivots around the driver and the promise of an exhilarating driving experience with sensitive steering, responsive acceleration and prompt shifting and braking. The Giulia also features perfect 50/50 weight distribution across the two axles, a sophisticated suspension system that is an Alfa Romeo exclusive and the most direct steering available in the market. Finally, the Alfa Romeo Giulia combines extraordinary engine performance and ample use of ultra light materials, like carbon fibre, aluminium, aluminium composite and plastic, to obtain the best weight-to-power ratio (lower than 3), enabling it to achieve a dry weight of just 1,524 kg. The top of the range Giulia Quadrifoglio, with its 510hp six-cylinder 2.9-litre turbo petrol engine delivers truly exhilarating performance levels - a top speed of 307 km/h, acceleration from 0 to 100 km/h in just 3.9 seconds and peak torque of 600 Nm, and continues the long QV tradition that began as a simple request for good luck and ended up becoming a symbol for something even more magical: track records and race victories from Alfa Romeo and the drivers who campaigned them. In 1923, legendary Alfa Romeo race car driver Ugo Sivocci wanted to break a string of second- place finishes. So, when he was preparing for the legendary Targa Florio race in Sicily, he painted a white square with a “Quadrifoglio”, or four-leaf clover, on the front of his Alfa Romeo Rl Targa Florio. And, as luck would have it, he finished in first place. Weeks later, Sivocci was track-testing a new car that didn’t yet bear his lucky symbol. Tragically, he crashed and lost his life. And a legend was born. This marked the beginning of a tradition: all future Alfa Romeo race cars would bear the four-leaf clover on a white triangle - with the missing corner symbolising the loss of Sivocci. 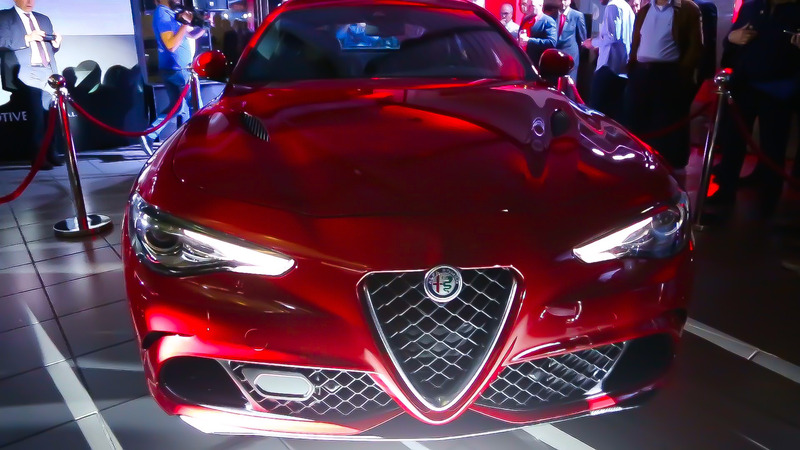 Later, the Quadrifoglio was also used to designate high-performance Alfa Romeo street vehicles like the 1963 Giulia Ti Super, the 1965 Giulia Sprint GTA and now, the all-new Giulia Quadrifoglio. Today, Sivocci’s clover remains a symbol of race-worthy capabilities and, of course, a symbol of good luck.